We used this type of composition notebook for math, science, history, and English. I have stacks of these notebooks filled with my children's work. A use for the composition notebook that I am writing about today is homemade handwriting lessons. 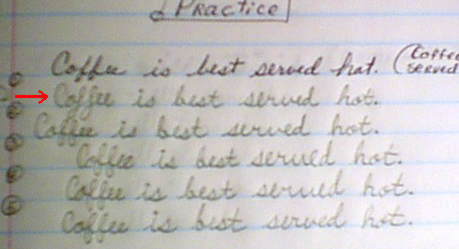 In our case, I used them as remedial lessons for cursive handwriting. This image shows a page from one of our composition books with handwriting lessons. As you can see from the image, I used one page for three lessons. For each lesson, I wrote a sentence in my handwriting and I typed the sentence using a handwriting font. Writing the sentence in your handwriting is important because your child will need to be able to read the handwriting of others. In some cases, I also printed the sentence just in case my handwriting was not quite legible. The lesson consisted of the student copying the sentence five times. If a problem arose, I gave instruction. When considering the sentences that you want to use, you can go about it randomly or purposely, either method will find holes in your child's abilities. If you already know your child's weak spots, then make sentences for them that contain their troublesome letters. My children seemed to forget how to make the letter "f" more than any other letter. On the left side of the open composition book, the student can practice the troublesome letters. This image shows the f written incorrectly in the first sentence and correctly in the remaining sentences. The use of a handwriting font for the handwriting sample is optional. I used one for the first few weeks of lessons, but later lessons did not include the handwriting font sample. There was no reason for this other than lack of time. Download and install a handwriting font if you do not already have one. Select the font from the font list in the word processor. Type the sentences, one per line, and adjust the size of the font. Default font size might be too small. Add an extra space under every third sentence. Print the sentences and cut them out in groups of three. This part is as easy as the rest. Decide how often to do the lessons: 3 times a week, 4 times a week, or daily. Have your child write the date in the left-hand column and write the sentence five times. You should look for problems immediately after the child writes the first sentence or after he is finished. The first is preferable, but if you do not have time, check later and make a note to instruct the child and make future lessons that include the troublesome letters.